Pitching legend Curt Schilling has decided not to run for the Massachusetts Senate seat left open by the late Sen. Ted Kennedy. 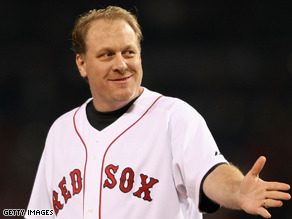 (CNN) - Pitching legend Curt Schilling has decided not to run for the Massachusetts Senate seat left open by the late Sen. Ted Kennedy. "Regardless of the amount of support and outreach that's been given to me, it just did not make sense," Schilling said on HBO's "Joe Buck Live." Earlier this month Schilling told a Boston radio station he was considering running for the seat, though added the chances were slim. Schilling also said then he had been approached by party leaders - including McCain - who advised he should consider mounting a campaign. But questions arose whether Schilling, a registered independent, would have been allowed to run on the GOP ticket. A recent poll of Massachusetts voters also suggested the former Red Sox star might not fair well in a state-wide political race, garnering less than a 30 percent approval rating. Republican State Sen. Scott Brown has announced he will run for the seat on the Republican side while state attorney Gen. Martha Coakley, Celtics co-owner Stephen Pagliuca, and Rep. Mike Capuano are battling for the Democratic nomination. Primaries are set to be held on December 8 while the general election will take place on January 19. There is only ONE man who should run for that seat and his name is Romney. He has been the governor and is a perfect replacement for ending the goofy Kennedy stranglehold. He can still run for President if he wishes, so nothing is lost. First smart thing he's said about this race. Wise choice. He would have gotten his clock cleaned. That's like Micheal Moore running for Joe Wilson's seat. What's a party larder? I live in John McCain's state and I don't know what a larder is.